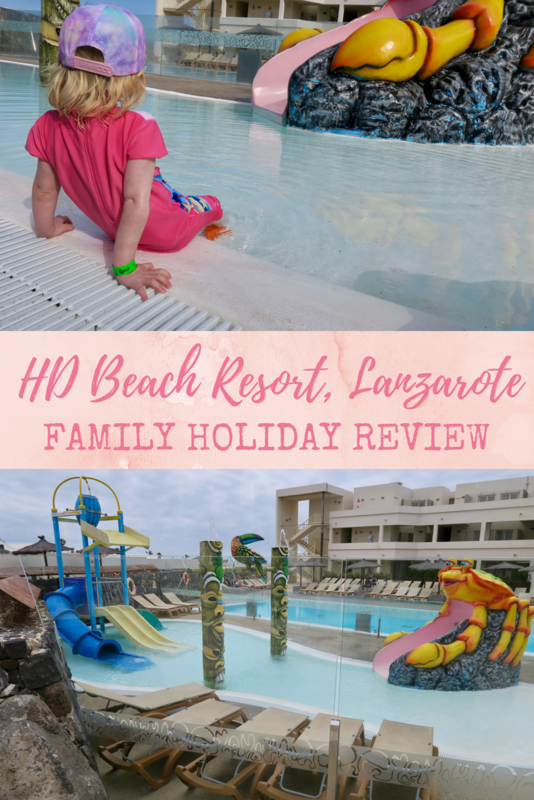 We recently had a very happy family holiday to HD Beach Resort, Costa Teguise, Lanzarote (affiliate link). I want to tell you all about our trip as it’s one we would recommend. We first saw the holiday on the Thomas Cook website for about £2500. Then, we searched to see if we could get a cheaper deal and found flights with Ryan Air and a room with Alpha Rooms. 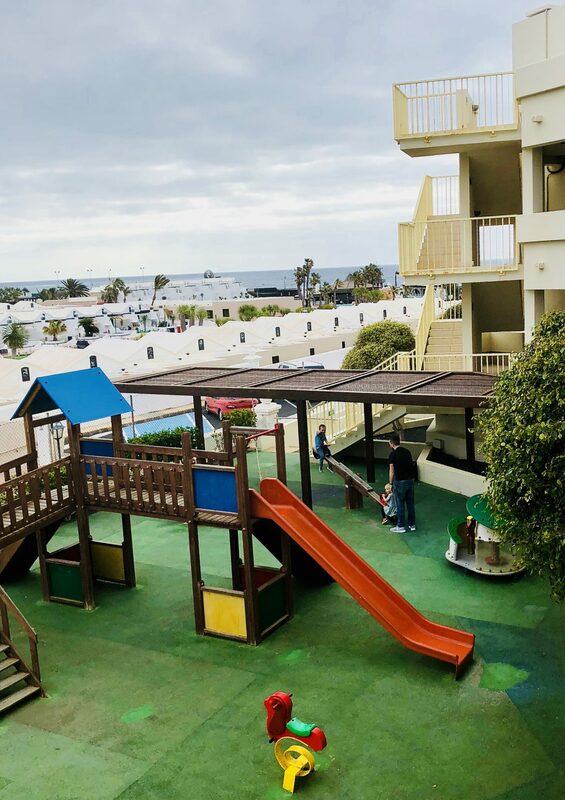 We ended up paying £1640 for four, all inclusive with private transfer, in term time in May flying out on a Saturday of bank holiday weekend (with good flight times). This was for a suite that was not pool or sea facing. We chose not to pay extra for a pool or sea view as we don’t stay in the room much so couldn’t justify the price increase. We did want to have a separate bedroom though so plumped for a suite. The junior suites have just one room so the bed will be next to the living area and pull out bed which is worth bearing in mind with little kids. 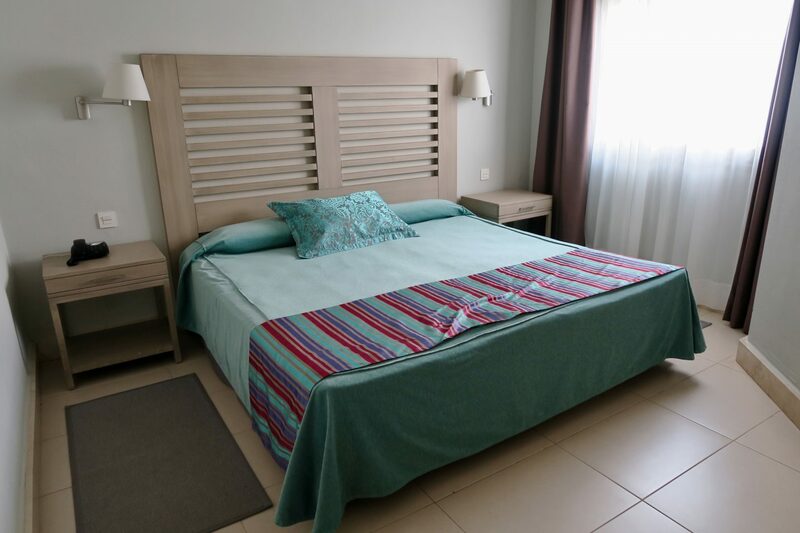 The room was clean and well equipped for an all inclusive stay. The shower was great, nice, hot and powerful (just how I like my men, jokes). The hairdryer was shite so if that’s important to you take your own. You could fart your hair dry faster. The bedroom in particular was spacious. There was plenty of wardrobe space for our whole family. The bed was two 3/4s pushed together so the end result was big. Bigger than my king at home, probably queen size. It made bed-sharing with a 3 year old much easier which I was grateful for. Actually, Lena has never slept better than she did there. I should move there. The toddler pool was a highlight of the holiday for us. My kids are 3 and 6 and can’t swim. They could paddle in it happily with us sitting on a lounger around it. The pool bar was near us so we could have a cocktail and watch the kids play in the water. One of the reasons we chose the hotel was its location. It’s only a 15 minute transfer from the airport. I hate it when you get off a plane and then have a long transfer. The kids have always had enough by that point so we always try and choose short transfer times and book private if it’s not too much more. 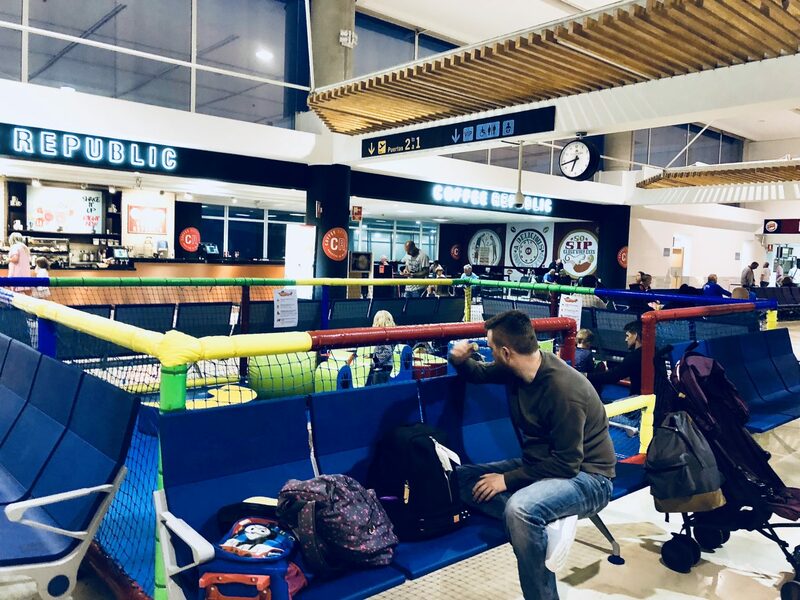 Pro tip – on your return flight, Lanzarote airport has a free small soft play area which really helped to entertain the kids while we waited for our flight – it’s right down the bottom so easy to miss if you don’t know it’s there. 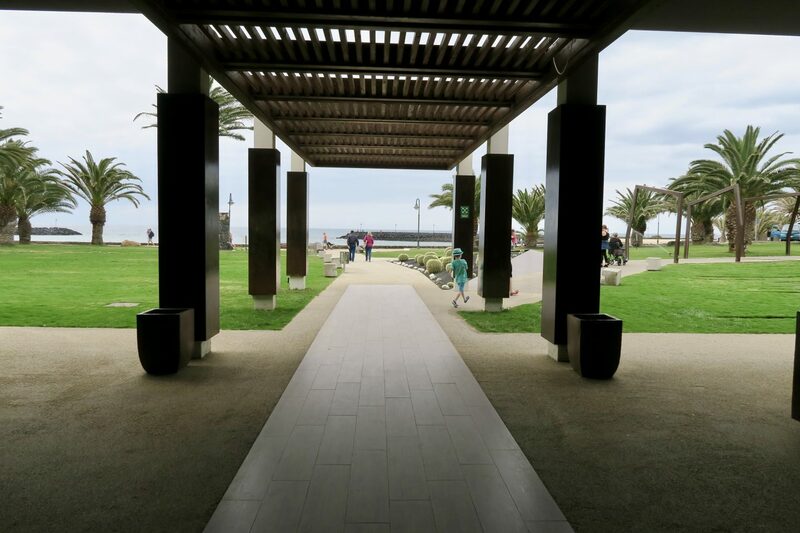 As the name suggests, HD Beach Resort is right on the beach. Within a couple of minutes from reception you are on the sand on a lovely little beach cove. 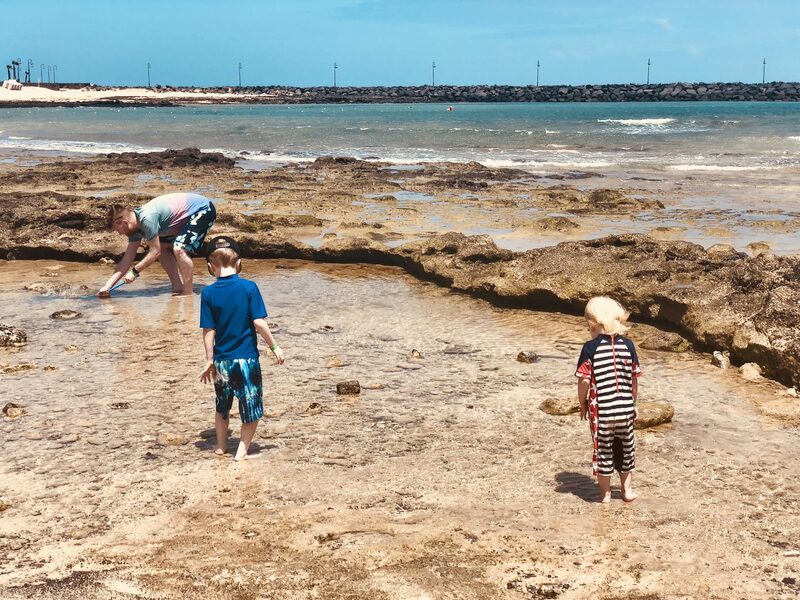 There were Little Rock pools with crabs and fish to watch and catch. We built sandcastles and paddled in the water. It was perfect. 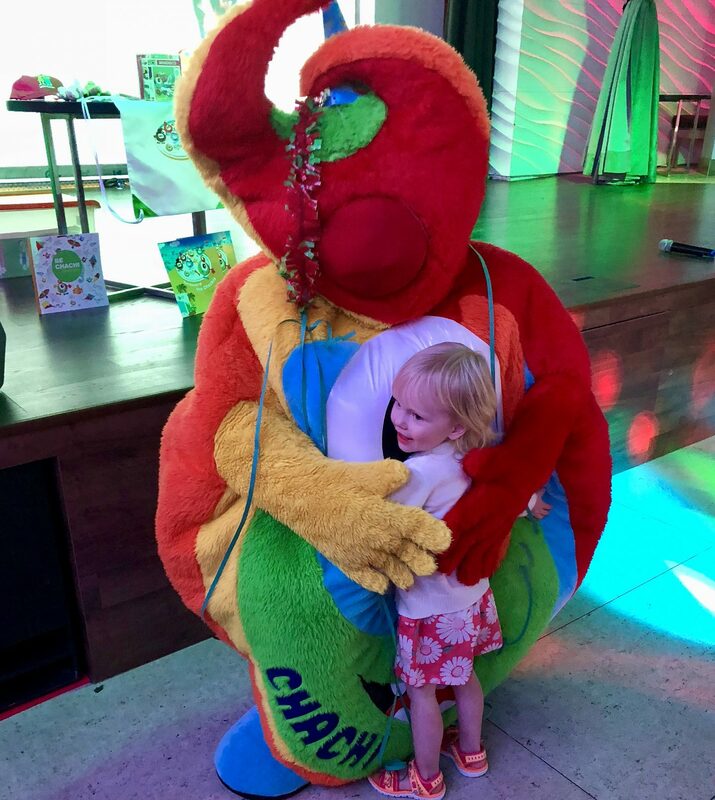 The absolute highlight of the holiday for the kids was the hotel mascot Chachi. I’ve still not entirely figured out what Chachi is but I think he’s the hotel logo in mascot form. The kids adored him and I think he took a shining to Lena in return. On our last night he kept picking her up and carrying her around the restaurant. There are two small play parks on site. So we visited one or both every day. 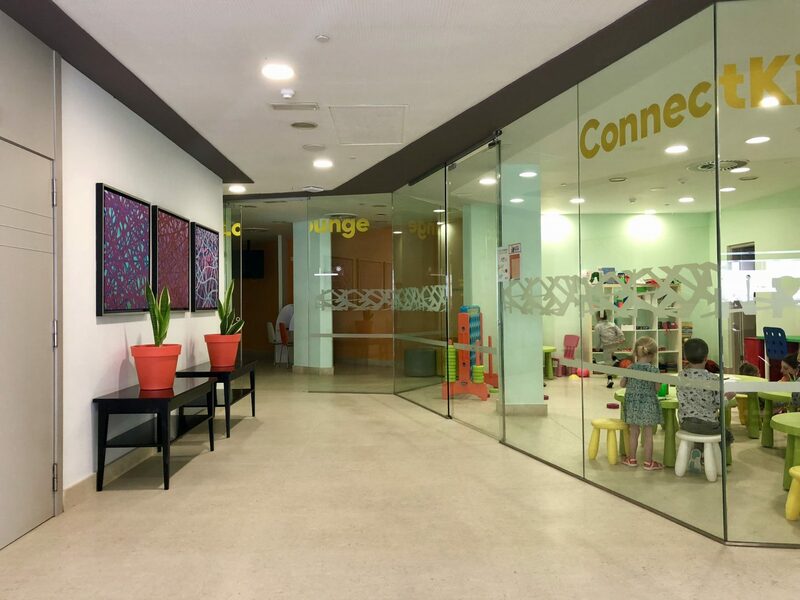 There are two kids clubs on site. 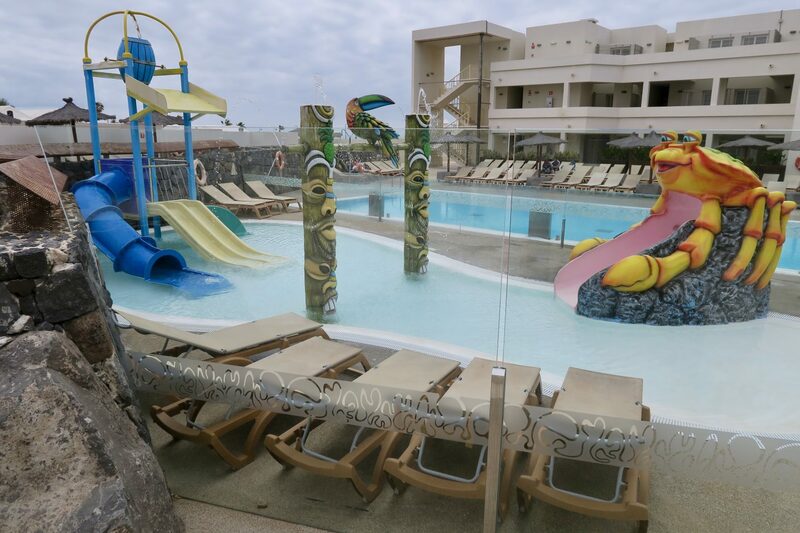 The hotel run kids club (4-12) runs twice a day in the morning and afternoon (10.30-12.30, 3.30-5.30). Then, Thomas Cook run a kids club 1(0-12 and 3-5) for ages 3-11. Although we didn’t book with Thomas Cook they took our children for no charge which was so cool of them. Kirsty and Danielle were great with the kids. They only arrived on our penultimate day but my kids went to a couple of sessions and had fun. It really helped entertain them when it was too cloudy and windy out for the pool/beach etc. At lunch and dinner in the restaurant there was a kids area with more kid friendly food, coloured plastic plates and it was low down so they could serve themselves. For older kids they have a ‘teen lounge’ with computers etc and there is an aqua park near by but my kids were too little for these. There is a gym on site but I didn’t go, it looked good though. The spa costs €5 and has a small pool, 3 jacuzzis and some steam rooms. Mind you it’s hardly ever staffed so would be easy to sneak in without paying. I also paid €50 for a ‘relaxing massage and facial’ session that was 50 minutes long. It was sublime and incidentally the first time I ever fell asleep in a massage. I tried to go back for an Indian head massage later in the week but couldn’t catch them to book in. On Trip Advisor the food gets a fair amount of criticism. I was hesitant about what to expect before we went but I was pleasantly surprised. I don’t know what those Trip Advisor people expect but we found the food and the choices great. I regularly review restaurants and can be teased for being a bit of a food snob and I loved the food and the choices. I didn’t find it luke warm as trip advisor people did. There were plenty of healthy choices too. The themed nights were great. In particular we all enjoyed the Chinese night and burger night. I love going to the Canary Islands for their canarian potatoes – if you know, you know! I can’t get enough of them and their rojo sauce and ate them every meal they were there for. Breakfasts were fab – with everything you could hope for at a breakfast buffet, including both British and Spanish bacon and decent sausages. We actually really miss the food there. You also get one meal at the a la carte restaurant. The food there was lovely but it wasn’t the best place to take very young kids – there were too many courses and Lena was bored and restless. The restaurant was quiet and so we kept having to take Lena outside to run around so she didn’t disturb the other diners (as did a few of the other tables with their little ones). In hindsight, we should have just done the normal buffet. What I loved about HD Beach Resort was that a lot of the drinks were self service. So there were little bar stations dotted around where you could get water, tropical beer, soft drinks, wine etc. Then there were serviced bars where you could get cocktails – all on all inclusive. 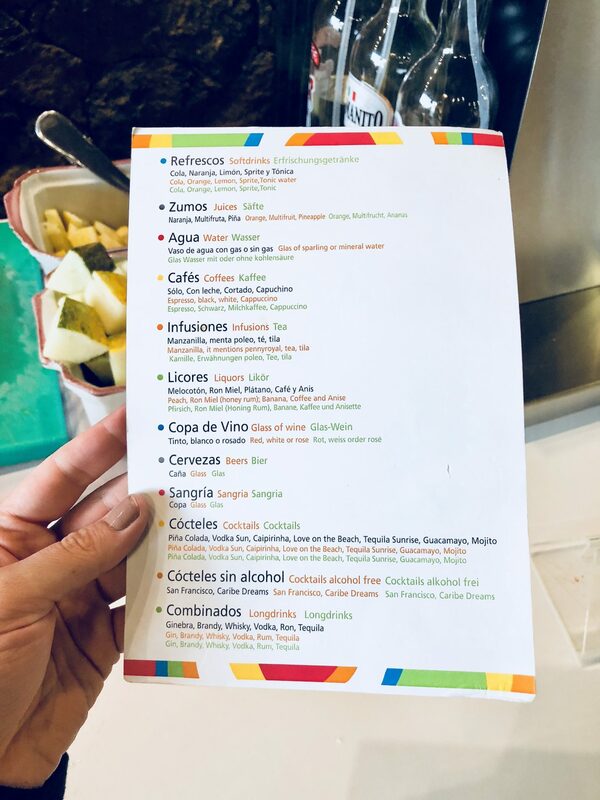 I loved the sangria, the mojitos and the pina colada. They weren’t top level cocktails like you get in say Turtle Bay but they were decent cocktails for all inclusive. The staff really deserve some credit as they were all really helpful and friendly. They worked their arses off and the holiday was more magical because of it. They are a credit to the place. 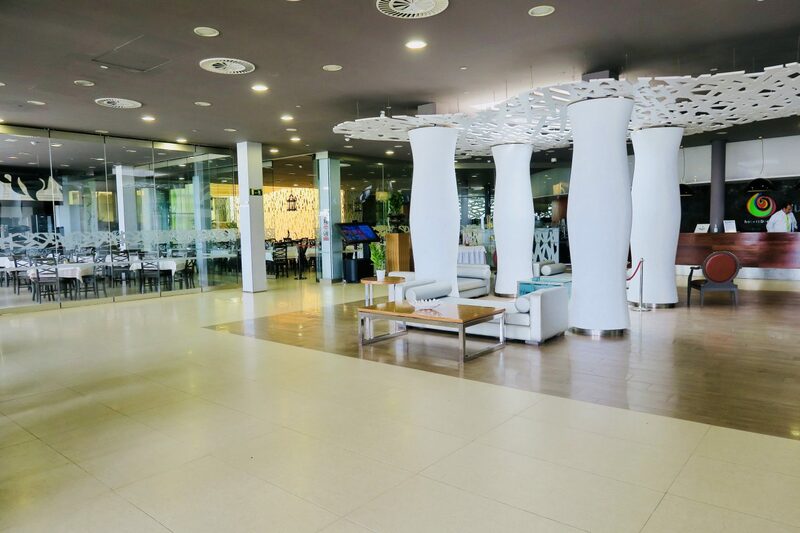 The hotel was perfect – clean and nicely decorated to modern standards. The wind – this is probably the only thing that would stop us rebooking to come back. Now if you’ve been to Lanzarote before, you’ll know what it’s like so if it didn’t deter you then, you’ll be fine. One of the things I love about the Canary Islands is the breeze off Africa. It keeps you cool when it’s very hot. But this holiday wasn’t very hot and the winds were 30-40kmh and it felt very gusty and chilly. Everywhere sold pegs and it wasn’t till late in the holiday I realised it was to pin your towels to sun-loungers etc. At the beach you couldn’t leave your towels or buckets and spades without them blowing away. I’m surprised we’ve come back with our hats they blew away so many times. 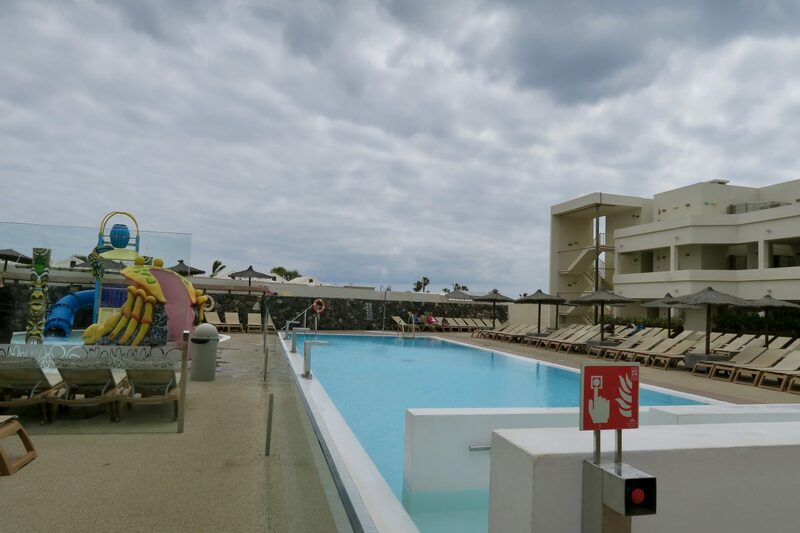 Personally, I prefer the light breeze of Gran Canaria to the gusty gales of Lanzarote. The pools were really cold. Like take your breath away and yelp cold. It really limited our pool time. The kids didn’t mind the toddler pool where they mainly paddled but none of us much liked getting fully submerged in the larger pools. I’m sure this wouldn’t be a problem later in the year but we went in May and it wasn’t super hot yet. They need to sort spa bookings out. You have to go to the spa to book them but the spa workers are always giving treatments. Then you have to go to reception to pay and get a ticket to take back to the spa. It’s a silly system where they are missing out on bookings. They need to change it so you can check availability, book and pay at main reception or through their app/online. Summary – would we go back? I’d say that this has probably been our favourite family holiday abroad so far. I’d really like to return sometime. The only thing that puts me off is how windy it is so I’d probably return in the hotter months so it wasn’t as much of an issue. 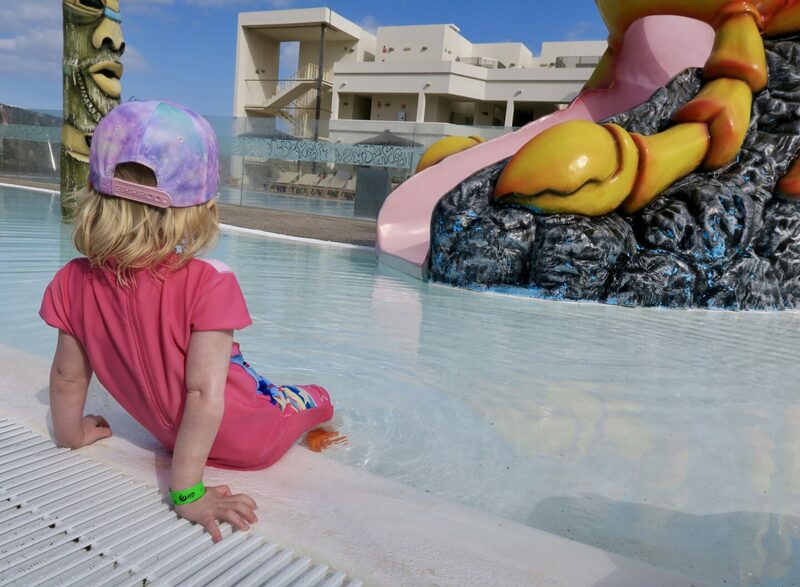 HD Beach Resort is a wonderful hotel if you have young kids like ours though and is perfectly located. I would thoroughly recommend you add it to your holiday shortlist! You can book it here via On the Beach (affiliate link). Disclaimer: This post contains clearly marked affiliate links. If you buy anything through an affiliate link you won’t pay anymore but we will receive a small payment from the brand for referring you. You can read more about my disclosure policy on my about page. Ah it looks fantastic. My mam had the same issue with winds in Lanzarote and I think for that reason I’d probably never book (she also had the same issue in Agadir in Morrocco). I *think* that one side of Lanzarote isn’t so windy but I may have just made that up! The food makes a holiday for me. It’s honestly the first thing I read about and research. I don’t know where half the people on TA get their ideas from if I’m honest as like you, I often find myself wondering what their problem is. I think a lot of people go abroad and expect a full on carvery every night at the buffet! 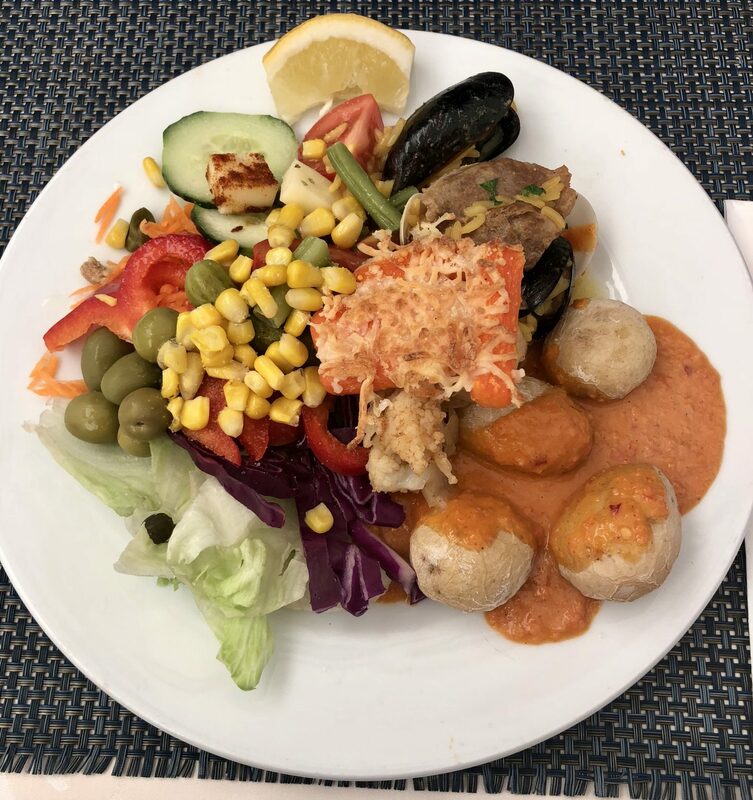 There is no way I would have been able to eat all inclusive all week though – I need to get out and about and try some local restaurants too but I get that it’s easy and you need to get your money’s worth! The restaurant area really reminds me of dining at Butlins where they have a section in the middle where kids can play etc… when they’re finished. Great review as always. So….where do you fancy next year? Yeah, our ideal is half the week all inclusive and half the week not to get about but honestly the food was great as we liked that we could get in and out fast with Lena and then straight into the mini disco. Next year I’m thinking Disney Paris! Sounds like you had a great trip. All inclusive s are so hit and miss, we need more reviews like this on the internet! I’ve been there many times, but couldn’t locate a suitable resort for my family. The HD beach resort looks fantastic. I will consider when I go there next time. Thanks for sharing. We’re looking to go somehere next year and this seems like a great deal for everything you got. Thanks Emma. We loved it, bar that wind! I would go back for sure.